Decorative Life: About 7 days. Cultivar selection can be important as leaf yellowing differences can vary greatly. Related species include poinsettia, crown-of-thorns. Flowers 1/2 inch long, occur along stem in drooping, wand-like sprays up to 1 foot long. Stems drooping, 2-3 feet long. Plant is a perennial shrub, classed as a dicotyledon, leaves not parallel veined. Holding this species even for short period of times at 50F or lower can be damaging. Therefore, it is chill sensitive. Colored parts of flowers are not petals, but are actually bracts. The specific epithet name fulgens means shining. 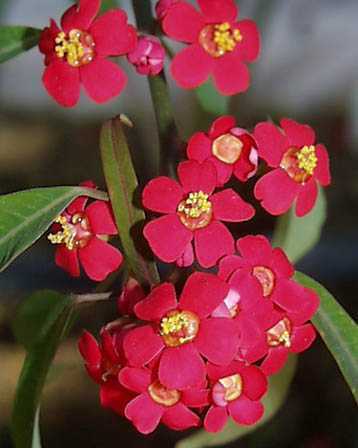 As with other Euphorbia, this species contains a white latex type material that is exuded when plant parts are broken.